Mark Twain said the key to happiness is to turn your vacation into your vocation. So, after many years in the corporate world, I did just that. I refinished my first floor 21 years ago and have a passion for turning old and worn wood into something vibrant and alive. Wood is natural and beautiful, an element not created by man, but shaped and finished by man. Over the past 20 years I have finished and shaped hundreds of thousands of square feet of hardwood floors. I love starting with a worn out, tired, and neglected floor and turning it into something bright and beautiful. 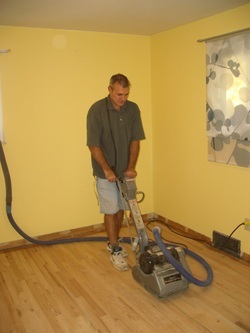 Pittsburgh Hardwood Refinishing LLC is an individually owned and operated company providing a full range of dustless / dust-free floor refinishing options. Its my company, I am the master refinisher and I come to your home to provide the estimates and review your project with you. I am also the person who works each and every project. When you're ready to refinish, renew, and rejuvenate your hardwood floors, give me a call and I will transform your house into a warm and inviting home.